Back in 2007, when the Constellation program to return to the Moon was still the program of record for NASA, a group from Lockheed Martin began investigating how they might be able to use the Orion lunar capsule to send humans on a mission to an asteroid. Originally, this plan — called Plymouth Rock — was just a study to see how an asteroid mission with Orion could possibly serve as a complement to the baseline of Constellation’s lunar mission plans. Now, it has turned into much more. The Orion MPCV being built and tested at Lockheed Martin in Boulder, Colorado. Credit: John O'Connor, NASATech.net. Click for super-large, pan-able image. Thanks to John O’Connor from NASATech.net, we are able to show you some views of the Orion MPCV inside Lockheed Martin’s facilities in Boulder, Colorado. If you click on the images, you’ll be taken to the NASATech website and extremely large versions of the images that you can pan around and see incredible details of the MPCV and the building. After canceling Constellation in February of 2010, two months later President Obama outlined sending astronauts to a nearby asteroid by 2025 and going to Mars by the mid-2030’s. In May of 2011, NASA confirmed that the centerpiece of those missions will be the Orion – now called the Orion MultiPurpose Crew Vehicle. The repurposed Orion lunar vehicle would now be going to an asteroid, just like Josh Hopkins and his team from Lockheed Martin envisioned in their Plymouth Rock study. Hopkins is the Principal Investigator for Advanced Human Exploration Missions, a team of engineers who develop plans and concepts for a variety of future human exploration missions. Concept drawing of the Plymouth Rock mission to an asteroid. Credit: Lockheed Martin. The Plymouth Rock design called for using two specially modified Orion spacecraft docked nose to nose in order to provide enough living space, propulsion, and life-support for two astronauts heading to an asteroid. But NASA has said the MPCV will be used primarily for launch and entry while a larger habitation module would be docked to the MPCV to enable a crew of 4 to travel to deep space. But even developing an in-space habitat could be a matter of repackaging things we already have. “The hab module could be derived directly from what we’ve done for space station, or it could be a commercial inflatable like from Bigelow, so that might be tried out by a commercial station or hotel in the next 10 years, so that would be demonstrated technology,” Jones said. 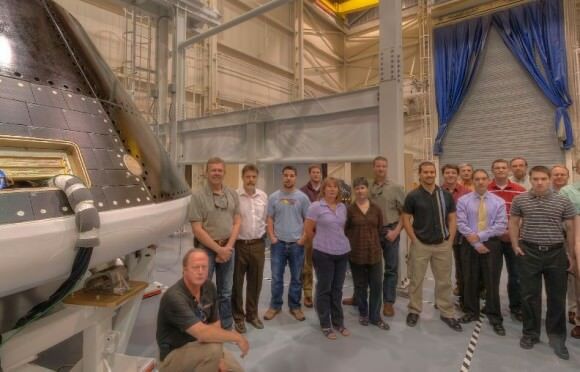 The Orion MPCV along with some of the people on the team that is developing and testing the capsule at the Lockheed Martin facility in Boulder, Colorado. Credit: John O'Connor, NASATech.net. Click for large, pan-able image. Hopkins added that when he and his team initially conceived the Plymouth Rock mission, they were trying to figure out how to do an asteroid mission for as little as possible. Using two Orions was cheaper than developing a module specific to an asteroid mission. “For Plymouth Rock, we had spelled out the need to basically increase the amount of food, water, oxygen and storage in the spacecraft, and some of that is accomplished by the fact of having two spacecraft,” Hopkins said. For now, NASA hasn’t yet changed many of the requirements for the MPCV from what they previously were for the lunar vehicle, and as the mission design evolves, so might the MPCV. But so far, the lunar design seems to be working, and Hopkins said there are several design features already in Orion that make it very capable as a deep space vehicle. For lunar missions, Orion was designed for basically 21 days with a crew on board going from Earth to the Moon and back and having a roughly have a six month “loiter period” while the crew was down on the lunar surface. That scenario would work for an asteroid mission, as a crewed flight to an asteroid would likely be about a six-month roundtrip journey, depending on the destination. Orion has solar arrays rather than fuel cells like Apollo, which enable longer missions. Another big selling point is that the MPCV is designed to be 10 times safer during ascent and entry than its predecessor, the space shuttle. At look inside the hatch of the Orion capsule at the Michoud Assembly Facility near New Orleans. Credit: John O'Connor, NASATech.net. Click for large, pan-able image. Logistically, the Orion MPCV could even support doing an EVA from the hatch on the capsule. Lockheed Martin’s Space Operations Simulation Center in Colorado can simulates the MPCV docking with an asteroid. Credit: John O'Connor, NASATech.net. Click for large, pan-able image. When the MPCV does return from a mission to an asteroid, it will likely land in the Pacific Ocean. NASA has begun some at NASA’s Langley Research Center to certify the vehicle for water landings. Engineers have dropped a 22,000-pound MPCV mockup into the basin. The test item is similar in size and shape to MPCV, but is more rigid so it can withstand multiple drops. Each test has a different drop velocity to represent the MPCV’s possible entry conditions during water landings. So while these tests are happening and while Hopkins and his team from Lockheed Martin are working on and testing the Orion MPCV, NASA is still trying to decide on a heavy-lift launch system capable of bringing humans beyond low Earth orbit and they have not named anyone to lead the design of a human mission to an asteroid. The NASA website doesn’t even have any official information about a human asteroid mission; it only mentions “beyond low Earth orbit” as the next stop for humans. So, that appears to be NASA’s current biggest hurdle to a human asteroid mission: deciding on the Space Launch System. Previous article in this series: Human Mission to an Asteroid: Why Should NASA Go? You can follow Universe Today senior editor Nancy Atkinson on Twitter: @Nancy_A. Follow Universe Today for the latest space and astronomy news on Twitter @universetoday and on Facebook. Double Orion for 2 people or add 1 more simple modul in between them for 2 or 3 people mission. I think it’s pretty clear. 2 Orion capsules with a Bigelow module in between them, there are options. This is what we should have been doing five years after Apollo 17, in addition to LEO programs like the shuttle. Asteroid missions are boring. I think this will get cancelled too because of lack of public interest. It is probably only going to be used for Low orbit. I am just glad they are not changing it from the lunar capabilities. Hopefully that means the mission can be changed back when we decide to return to the moon. Maybe after the next election.